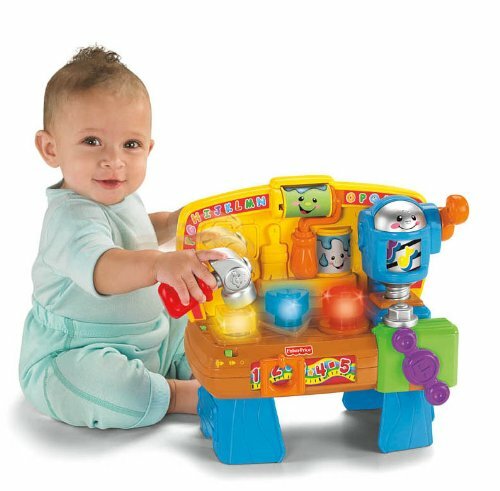 Babies love to explore and that's why this toy is so good. I saw this toy and knew that my sister's daughter would just love it. It's brightly colored and looks like so much fun that my two-year-old niece was simply squirming with delight as soon as she saw it. Some educational toys are interesting to children when they first get them, however some are not able to keep the child's interest for very long. That has certainly not been the problem with this one. In fact, there haven't been any problems with this one. What Your Kids Can Learn? The first one is called, "It's Learning Time". In this mode baby learns the alphabet by singing along to the alphabet song. If you drop balls down the rain spout, not only does baby learn about counting, there's a musical reward. Baby can sing-along to the itsy-bitsy spider song. The second one is called, "It's Music Time". In this mode baby can sing along with 21 songs. In addition to the popular songs that I have mentioned below, there are songs with lyrics for counting opposites colors and more.Children have always loved singing along with their favorite characters on shows such as Sesame Street, and singing along with the learning home is no different. Who knows, perhaps your toddler will become one of the next great singers. 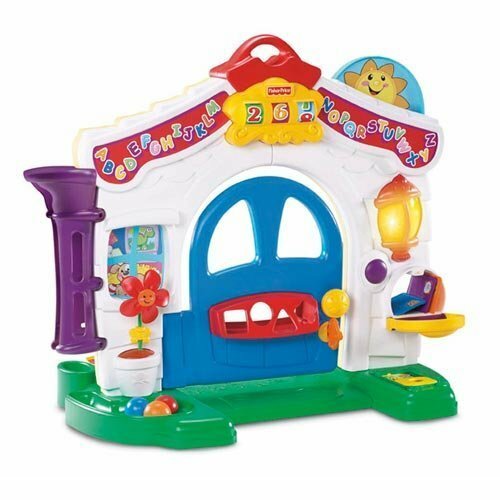 Fisher-Price apparently knows just how much noise kids are capable of making and has designed the Fisher-Price Learning Home with two volume levels. On the lower setting, it is very difficult to even hear the learning home unless you're sitting right there with your child. My niece Diana, especially has learned to love that last part about dropping balls down the drain spout. She loves the itsy-bitsy spider song and there's nothing she loves more than starting the song by dropping more balls down the drain spout. She also seems to enjoy putting mail through the mail slot in the door. Sometimes she just goes in and out the door to listen to the noises it makes is it creaks open and slams shut. It doesn't actually slam because that might hurt her. It just makes the sound of the door closing. Opposites seems to be a real focus of this toy. Opening and closing. An and out. Other activities that she's enjoying are such things as spinning house numbers and she likes moving the dials on the clock. For some reason she finds this particularly amusing. Every time she does it, she starts laughing. It's hysterical to watch. The house also teaches opposites like on and off, open and close, day and night, and up and down. She's learning to sort shapes and she's learning her colors. Diana is learning to love music also. Some of the songs that she's learning from the Fisher-Price Learning Home are the Welcome Home Song, Itsy-Bitsy Spider which I already mentioned, Doggie in the Window, and Hickory Dickory Doc. I believe that she is going to have a real leg up for when she begins school. And isn't that one of the most important functions of an educational toy? She's already getting a head start on understanding numbers and letters colors and shapes. She learns to make connections between words and images. The stimulation she's receiving is causing her vocabulary to expand much more quickly than I would've expected. She's even receiving subtle training in learning to think as the house encourages problem-solving with its many action/reaction activities. It is my opinion that perhaps the most important function the Fisher-Price Learning Home serves is building self-confidence in toddlers. Self-confidence is one of the most important personality traits a human being can have. It frees a person to really expand their horizons and reach for more than they would otherwise. Self-confidence taught from an early age is probably the most important gift you can give a child. Once they believe in themselves, there really is nothing that they can't accomplish. The wonderful thing about the Fisher-Price Learning Home is that Diana is learning the self-confidence and a sense of empowerment. I know that throughout the rest of her life she will believe that she can learn and accomplish anything she wants to. When Fisher-Price created the learning home, they may not have even realized what an important part it might play in some young people's lives. It's no wonder that this toy has received rave reviews, including this one. 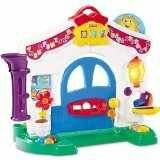 The Fisher-Price Learning Home is a wonderful educational toy that gets toddlers started on a successful life. What is the best educational toy you bought for your tots last Christmas?